British Paralympian Kenny Allen will focus on able-bodied archery after being told he no longer qualifies for para-archery. 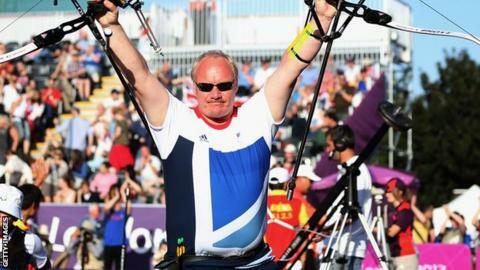 The 43-year-old from Wymondham set a Paralympic record at London 2012 and narrowly missed out on a team medal. Allen has spina bifida but does not meet the new reclassified levels of disability. "I wanted to continue with my Paralympic career and head off to Rio," he told BBC Radio Norfolk. "I'm still going to shoot domestically and last year I shot the scores for the able-bodied qualifying for the European Championships." Britain's two-time Paralympic archery champion Danielle Brown also fell short in the reclassification and will not be able to compete in any Paralympic events. Allen shot a Paralympic record 651 in the men's standing recurve ranking round at the London Games and was in the men's team which finished fourth. But he will attempt to qualify for the British team for the able-bodied European Championships at a selection shoot next month. "I can give the Olympic squad a good run for their money," he said. "You have to be confident in a sport like archery. If you think you're going to lose before you go out, you will. "If all else fails, I can go down the coaching route with the Paralympic team. I've got a lot to give back." Allen's condition affects his sensation and he has no feeling in his right foot, on which he has lost numerous toes. In a statement, Archery UK said: "An important part of the Para-Archery competition is the classification of the archers. "Different forms of disability can affect people differently, therefore archers need to undergo a set of specific tests, the outcomes of which then decide which class they can compete in. "The most recent re-classification took place in March at the Asian Grand Prix in Bangkok. The new rules came into full effect on 1 April 2014."